There is a brand that I am obsessing about which is called Kreyòl Essence. Kreyòl Essence is a Haitian owned company that features hair and body products. 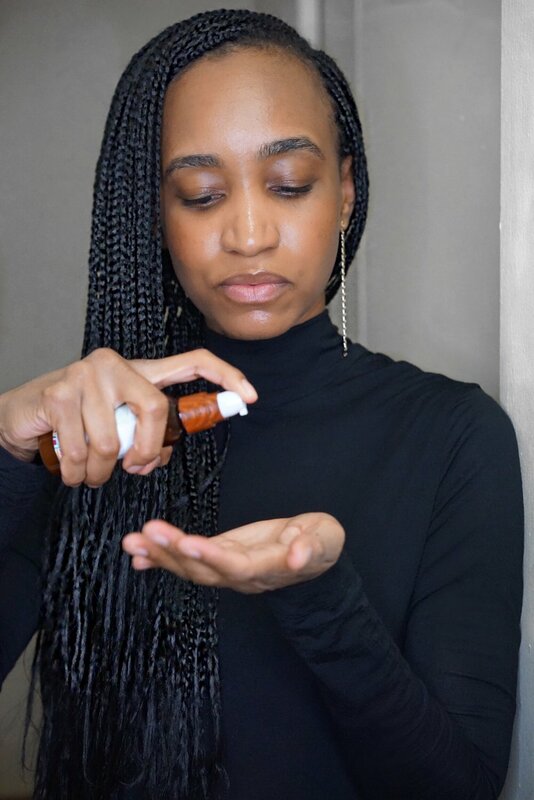 When I was asked to participate in their Kreyòl Essence Influencer campaign, I was so excited because one of the products they sell is the famous Haitian black castor oil. It is a product that I know all too well. Flash back a few years ... I remember when I was living in Haiti, black castor oil was something that was always used as an oil treatment for my hair, and let’s just say it: in every household. This oil not only repairs damaged hair, it helps with hair growth. Talk about all in one! This castor oil, “lwil maskriti”, is a popular in-demand product in Haiti, and it is a staple of any women’s hair routine. When I left Haiti to live in New York, I remembered searching for that same type of black castor oil. To my dismay, this castor oil type wasn't sold anywhere. Throughout the years, I have tried other castor oils. But the results were always disappointing. Then I discovered Kreyòl Essence and their line of Haitian products within the United States. To my surprise and excitement, black castor oil is one of the company’s key products. When I tried their Haitian black castor oil, I was instantly taken by its wonderful smell. The castor oil that I have is infused with organic lavender oil and hibiscus. It did not have the greasy texture that castor oil is known to have. Kreyòl Essence’s castor oil is more refined and soothing to the hair scalp. I really enjoy how easily it blends into my hair. I love how well it moisturizes my hair without leaving any residue in my scalp despite my braided hair. Some of the beneficial ingredients within the Haitian black castor include omega fatty acids 3, 6, and 9 along with vitamin E which are vital for promoting hair growth. Other Kreyòl Essence products include the Haitian Moringa facial cleanser which helps to smooth dark spots and eliminate blemishes. After using the cleanser, I enjoyed the Haitian Moringa facial oil which serves as a moisturizer. I loved using both of these products together! Overall, I am so happy to have discovered Kreyòl Essence and its amazing product line. I am comfortable knowing that their products are animal cruelty-free, all-natural and eco-friendly. And the positive socioeconomic impact of Kreyòl Essence is that every purchase helps farmers and women throughout Haiti. When it comes to products that work, I always strive to be honest with you guys and I highly recommend Kreyòl Essence. Their products can easily be now found at Whole Foods and of course their websites. Do visit kreyolessence.com for specific store locations. Muah!